PLEASE CONTACT MY PROGRAM COORDINATOR TODAY! All Client CEOs have direct contact with me to determine which program is right for their business; just takes ten minutes. I can give you personal, one-on-one services, come to your company, work electronically, or you can choose one of our fixed price programs listed below. Access to the Webinars, Documents*, Certification Test and Update Forums; time with your staff online [includes up to TEN Certifications without extra charge]. 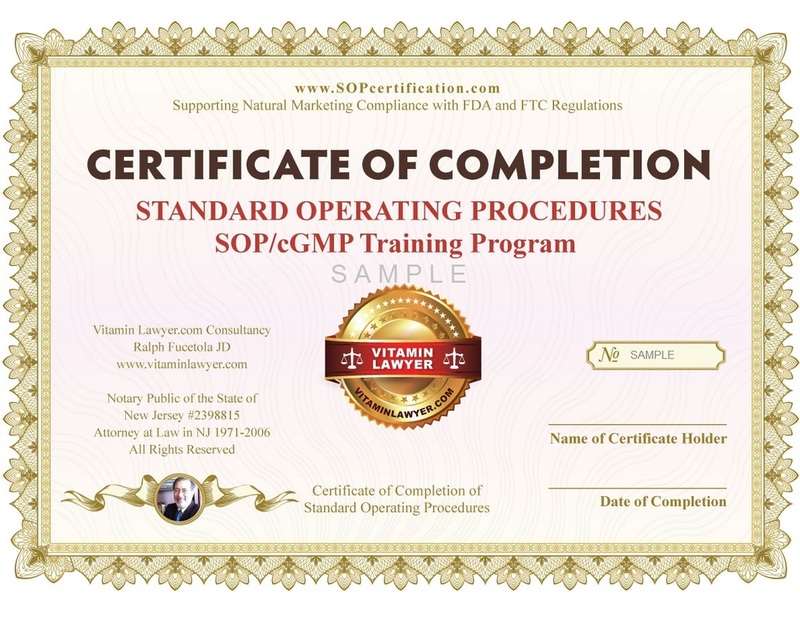 Counsel Ralph works with your CEO to complete the SOP document and provides a live online, recorded discussion with your staff as part of the training. Your recording is for your use only. Access to the Webinars, Documents* and Certification Test [includes up to FOUR Certifications without extra charge]. Your CEO and Counsel Ralph discuss customizing the SOPs. Access to the Online Webinars, Documents*, Test and SOP Format [includes ONE Certification without extra charge]. Live or Online System with Quick Access, 24/7 Availability! The Webinars, the Documents [including SOP Format, Training Manual eBook, Update Forums and Certification Test] are housed on a secure server. Access is by permission only. Please use the form to the right to request access. Fees depend on the Services Used and Company Size. Fees are due in advance of Services. I am happy to discuss our fees with potential customers. For an Outline of the Webinars, CLICK HERE. Programs conclude with Certification of Completion, which are not to be confused with accredited certifications of competence. FDA does not provide certifications of competence. "The FDA showed up unannounced. Said they’d be here for at least six days. We showed them the SOPs Counsel Ralph prepared for us. They left after two days. It was comforting to know we could call Ralph any time during this, and he was there for us."